It is particularly spectacular to watch the beautiful displays of gymnasts on the floor, vaults, balance beam and on the uneven bars and Laurie Hernandez is one of the talented gymnasts who has been skillful in these four aspects of the sport. The sport of gymnastics is one of the most beautiful acrobatic displays that dates back to 1881. However, the artistic aspect of the sport was introduced in the 19th century with the German educator, Friedrich Ludwig Jahn said to be the founding father. Laurie Hernandez started her gymnastics career as a teenager and has bagged several medals and awards. She is definitely one of the best in the sports and has represented the United States of America as a senior in the 2016 Olympics which they won. She also grabbed the prize money for the 23rd season of Dancing With The Star with her partner. Born as Lauren Zoe Hernandez, the youngest of 3 children birthed by her parents on June 9, 2000, in Old Bridge Township, New Jersey. She had her high school education at Abeka Academy High School, Old Bridge Township, New Jersey. She has ancestral ties in Puerto Rica while she holds the American nationality. 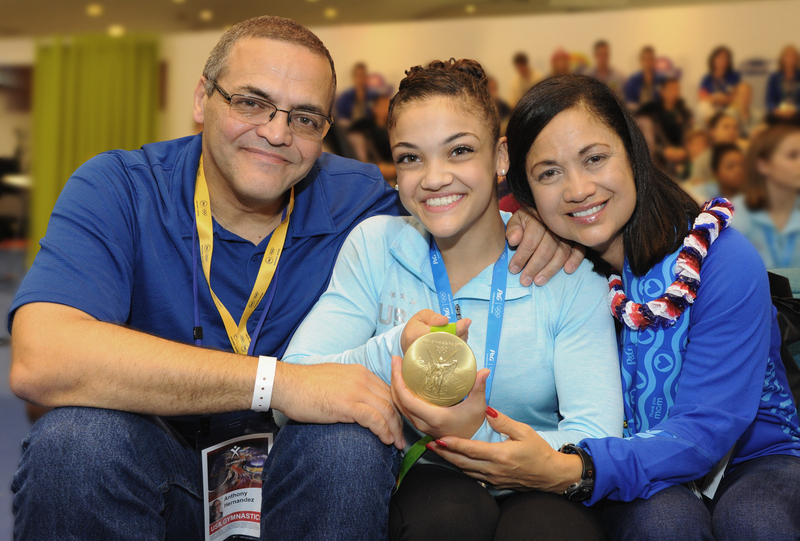 From an early age of 6, Laurie Hernandez began practicing and participating actively in gymnastics activities, under the tutelage of Coach Maggy Haney. It, therefore, was not surprising, when she chose artistic gymnastics as a career in 2012. She signed up for the United States Classics for the junior category where she performed excellently well. Her performance in the US junior Classic qualified her to partake in the Gymnastics National Championship where she ranked 21st after 2 days of competition. By 2013 season, she entered for her first World Olympics Gymnastics Academy Classic (WOGA) and the American Classic where she came tops in the three major categories (Floor, Beam, and Vault). She was later selected to join the US Junior National Team and her outing in July 2013 Championship saw her take the floor exercise title while she came out 6th overall in the championship. In 2014, she signed up with the University of Florida Gymnastics team – Florida Gators Gymnastics, where she actively participated in the National Collegiate Athletic Association (NCCA) Championships. However, Laurie Hernandez’s 2014 season was marred with various sports injuries she sustained in training, from a fractured wrist to torn tendon (patellar) and dislocated kneecaps which saw her off the gymnastics courts for about six months. Thankfully by 2015, she regained her form and fired through the season, as she carted away the Jesolo Trophy and later earned the Junior All-Round title of the US classic season. Moreso, she competed internationally in the Japan Meet in Yokohama, where she clinched the All-around title for floor events and vaults while she got a silver medal for her efforts on the balance beam and uneven bars. Laurie Hernandez entered into her senior gymnastics championship in 2016 after she forfeited her remaining years of eligibility. She competed in April 2016 at the Pacific Rim Championship which held in Xfinity Arena in Everett Community College, Washington. She won a gold medal from the competition before she proceeded to the Olympics later that year. It is worthy of note that she was part of the US girls gymnastics team dubbed the Final Five comprising of Aly Raisman, Simone Biles, Gabby Douglas, Madison Kocian and Laurie Hernandez herself. They partook in the 2016 Olympics that held in Rio de Janeiro, Brazil that made away with gold medals at the competition and for her personal efforts on the balance beam, she earned a silver medal. The Olympic Gold medalist is described by judges as Shakira because of her artistic skills displayed on the floor of the exercise which they say has a semblance of the two powerful superstars, Beyonce and Shakira doing their thing on the floor. Furthermore, the human emoji, as she is called by her family because of her chubby smiling face, took time out from the court in 2016 to enter in for the 23rd edition of the famous ABC television show Dancing with the Star (DWTS). She ended up winning the season’s dance with her Ukrainian-American born partner, Val Chmerkovskiy, thus, she became the show’s youngest winner. Following her victory, she made appearances in a few television shows like Jimmy Fallon, The Ellen DeGeneres, Good Morning America and Stuck In The Middle to mention a few of them. Moreover, she has also authored a best selling book entitled I Got This: To Gold and Beyond which was published in January 2017. In September 2018, Hernandez was selected to be part of the cast in the Nickelodeon’s animated film titled Middle School Moguls, where she will voice the character of Valeria. She is also a social bee, with active Instagram and Twitter accounts where she shares interesting stories and updates on her activities. Lauren Hernandez’s net worth is estimated to be within $2 million, which is money she earned from mining her trade as an artistic gymnast and her additional win at the Dancing With The Stars. Hernandez has other elder siblings, a brother Marcus and sister Jelysa Hernandez whom she grew up with. Her parents are Anthony and Wanda Hernandez, whose support for the young starlet is evident in the fact that they signed her up for the gymnastics’ and dance lessons early on in her life. And although the dance lessons did not cut it for Laurie Hernandez, the gymnastics did and so their efforts was paid off. She has been a very outstanding athlete, using all she has gathered in both lessons to mine her trade in gymnastics. Her father is reported to be a court clerk while her mother, Wanda, was in the Army for six years as a reserve and is also a social worker. Her grandmother Brunilda Hernandez who had been down with cancer finally succumbed to the disease while Laurie Hernandez was in the DWTS. The young athlete is basically focused on building her career and finishing up her education although she is largely a private person who has not said if she is now dating. One thing we know is that she does have a friend – Randall Anderson with whom she went to her Prom. They met in 2015. The award-winning athlete is said to be 5 feet 1 inch (1.55 m) tall. Her frame is firmly held by the weight of 48 kilograms (105.8 lb). She is actually taller than few other gymnasts including Simone Biles but she stands almost shoulder to shoulder with Shawn Johnson.